Manisha Sinha is professor and the James L. and Shirley A. Draper Chair in American History. She was born in India and received her Ph.D from Columbia University where her dissertation was nominated for the Bancroft prize. She was awarded the Chancellor’s Medal, the highest honor bestowed on faculty, from the University of Massachusetts, Amherst, where she taught for over twenty years. Her recent book The Slave’s Cause was reviewed by The Times Literary Supplement, The New York Review of Books, The Wall Street Journal, The New York Times, The Christian Science Monitor, The Atlantic, and The Boston Globe, among other newspapers and journals. It was featured as the Editor’s Choice of the New York Times Book Review. It was named the book of the week by Times Higher Education in May, 2016 to coincide with its UK publication and one of three Great History Books for 2016 in Bloomberg News. Her first book, The Counterrevolution of Slavery, was named one of the ten best books on slavery in Politico in 2015. 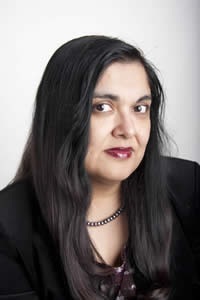 Sinha’s research interests lie in United States history, especially the transnational histories of slavery and abolition and the history of the Civil War and Reconstruction. She is a member of the Board of the Society of Civil War Historians and of the Council of Advisors of the Lapidus Center for the Historical Analysis of Transatlantic Slavery at the Schomburg, New York Public Library. She is a co-editor of the “Race and the Atlantic World, 1700-1900,” series of the University of Georgia Press and is on the editorial board of the Journal of the Civil War Era and Slavery and Abolition. She has written for The New York Times, The New York Daily News, Time Magazine, CNN, The Boston Globe, The Washington Post, Dissent, Jacobin, and The Huffington Post and been interviewed by The Times of London, The New York Times, Smithsonian Magazine, The Boston Globe, Slate, The Daily Caller, and Gothamist. She has appeared on Jon Stewart’s The Daily Show, TLC’s Who Do You Think You Are and was an adviser and on-screen expert for the Emmy nominated PBS documentary, The Abolitionists (2013), which is a part of the NEH funded Created Equal series. She is currently writing a book on the “Greater Reconstruction” of American democracy and capitalism after the Civil War under contract with Basic Books. Afterword: “The History and Legacy of Jacksonian Democracy,” Journal of the Early Republic 39 (Spring 2019): 145-8. “The Problem of Abolition in the Age of Capitalism,” American Historical Review 124 (February 2019): 144-163.